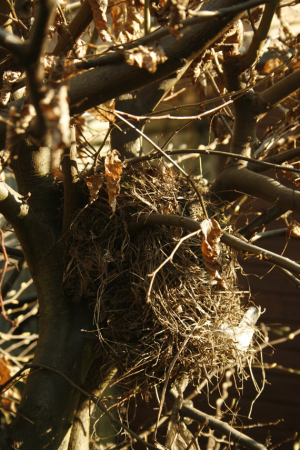 Observation - bird nest (blackbird?) - UK and Ireland. Description: Bird's nest. It's about 140cm off the ground, 16cm wide and 17cm deep. What bird made it? Was it a blackbird? Bird's nest. It's about 140cm off the ground, 16cm wide and 17cm deep. What bird made it? Was it a blackbird?